Los Angeles Clippers owner Donald Sterling has said he is not a racist and will not sell the professional basketball team, US media report. In a recording obtained by RadarOnline, a man who is reportedly Mr Sterling is heard saying he does not believe he can be forced to sell. He was banned from the National Basketball Association for life after he was recorded making racist remarks. But Mr Sterling, 81, could oppose the sale in the courts, according to sports lawyers. 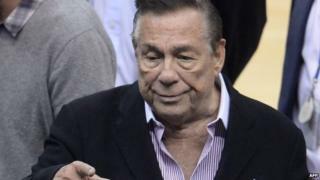 In the recording of what appears to be a phone conversation between Mr Sterling and another man, the Clippers owner says: "You think I'm a racist? You think I have anything in the world but love for everybody? ... You know I'm not a racist!" "How can you be in this business and be a racist?" Mr Sterling asked. "Do you think I tell the coach to get white players or to get the best player he can get?" He also told the other man: "You can't force somebody to sell property in America. I'm a lawyer. That's my opinion." Mr Sterling explains his background growing up in East Los Angeles would make him accepting of others. "I was the president of the high school there. I mean, and I'm a Jew! And 50% of the people there were black and 40% were Hispanic. "So I mean, people must have a good feeling for me." The most recent recording emerged as Mr Sterling's estranged wife told US media she will fight for a controlling stake of the team. Shelly Sterling is a co-owner of the Clippers through a family trust. Her lawyer, Pierce O'Donnell, said in a statement she "will not agree to a forced or involuntary seizure of her interest". He added Mrs Sterling has been separated from her husband for the last year and is considering divorce. She also said through her lawyer she has no interest in managing the Clippers. "The Sterlings may share the same last name, but she does not share his values on race," Mr O'Donnell said. "The sins of the husband cannot be imputed to the wife or children."